We touched down into Addis Ababa late in the night. On the flight, we were fortunate to meet a couple, David and Joan, who had been coming to Ethiopia for the last 14 years. Recently, they had been sponsoring a student through university and subsequently helping him to start an internet cafe. Such businesses were rather short-lived in the UK but still have a place in East Africa, where few people own computers. David was particularly excited to hear it was our first time. Taking the vacant seat next to us, he wanted to know every detail about our itinerary and share his top travel tips. Helpful though this was, after 10 minutes we were rather overwhelmed by his enthusiasm. Our itinerary was rough and deliberately vague to leave space for flexibility and spontaneity. After all, the best adventures often contain an element of surprise. After exchanging money and receiving our $50 visas, we shared a taxi with our new friends. Our hotels happened to be close to each other. C and I were rather taken aback when David and Joan told us they were staying in a brothel. “It’s very cheap!” David boasted. I’m sure it is, but I was quietly glad we were heading to the delightfully named hotel, Mr Martin’s Cosy Place. 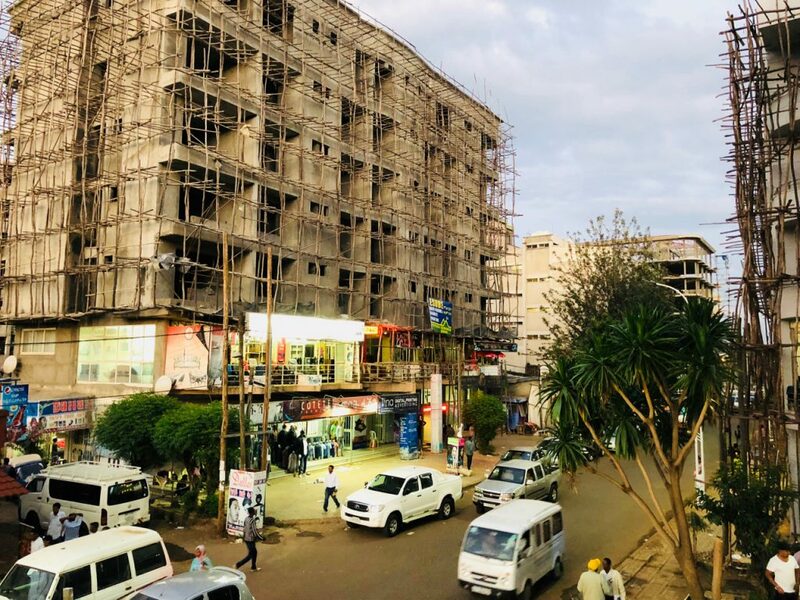 Mr Martin’s Cosy Place is a standard, no-frills hotel in the Bole District, which we are told is a slightly hipper end of Addis. We spent one day in Addis initially. It’s hardly a relaxing city. Our first job involved buying a bus ticket out. Many tourists in Ethiopia jet around the country by plane, from one tourist destination to the next. Providing you have the money, this makes sense. It’s a vast country over four times larger than the UK. However, we were keen to stay grounded and travel by bus. This way we can properly absorb the landscapes, breath in the air, smell the aromas, enjoy the music and feel the bumps in the roads. It’s also vastly cheaper. As is often the case at bus stations, there was a fair amount of chaos. Hustlers keen to assist – new “friends” curious to learn where we were from, to practice their English and hear of our destinations with the kind offer of guide services. It’s been awhile since I’ve had to deal with all this and we had to exercise many polite but firm “no thank yous”. With bus tickets in hand, we jumped into a taxi and headed for a recommended lunch spot around the Piazza area: Taitu Hotel. Unfortunately, the taxi broke down en route, chugging and sputtering to a stop in the middle of a busy junction causing mayhem and fury from other road users. Some passers-by rescued us, pushing us to the edge of the road. The clutch sounded knackered. We thanked our driver for trying his best and walked the rest of the way using the map in the Lonely Planet guide. These maps really are terrible and I would never recommend trying to rely on them. But it was all we had and miraculously we muddled our way there. Taitu Hotel is a welcome break from the hot, sweaty, dusty energy of the streets. An old rustic hideaway, where the air is heavy with frankincense and the aromas of coffee roasting. An old lady played the piano, running her fingers gently up and down the keys, playing those distinctive Ethiopian scales. Their vegan buffet, while expensive by local standards, was delicious and over the coffee afterwards, we made our afternoon plans. We decided to visit the museum that houses the famous Lucy, locally known as Dinkinesh in Amharic, meaning “you are marvellous”. 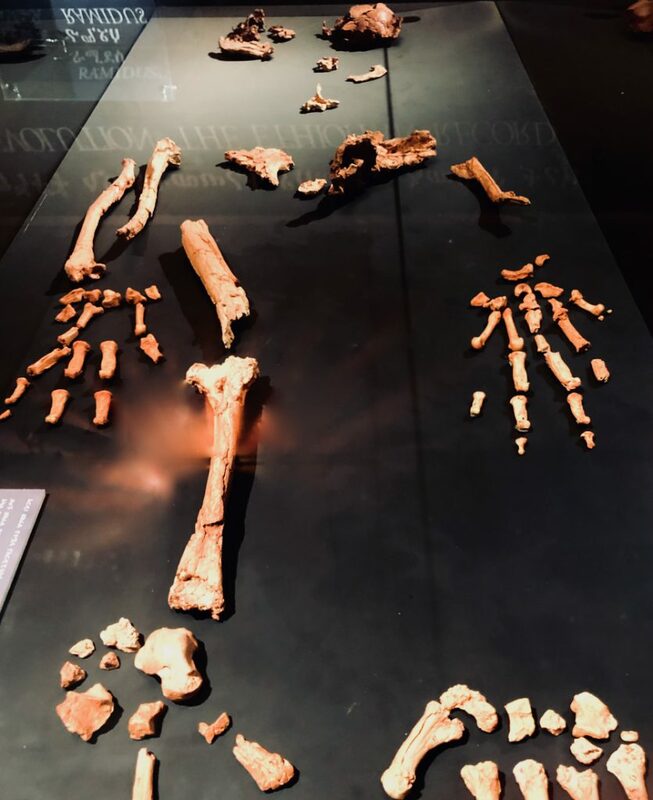 Lucy is a notable skeleton, some 3.2 million years old, whose discovery in 1974 changed our understanding of human evolution. I marvelled at these old bones, trying to imagine life in those feral, primitive times. Living in the rainforests, climbing trees and hunting wild animals. A month later, I was to learn that the real Lucy is hidden out the back under tight security. We were just looking at the replica. The rest of the museum painted a picture of the past, through its display of traditional clothes, paintings, ornamentals, instruments and furniture. Later that evening, we went to a restaurant named Habesha 2000. 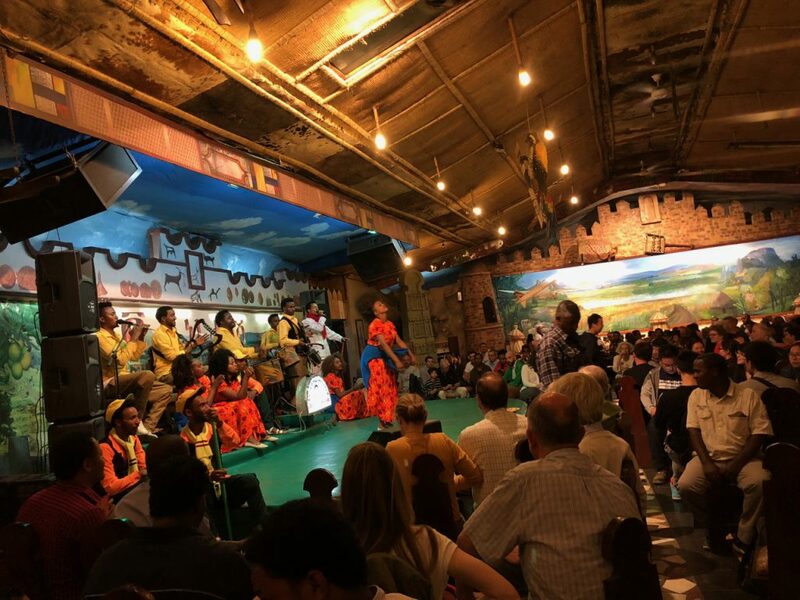 It was a touristy-choice and on the more expensive side too, however, we picked it for the show, which was a lot of fun, involving some excellent dancing and a house-band, playing a range of Ethiopian hits. For the first time, I saw the famous shoulder dancing. Several embarrassed tourists were led to the stage to join in with the dancing too, fortunately not us. Early next morning, before the sun had risen, we boarded a bus to Bahir Dar. 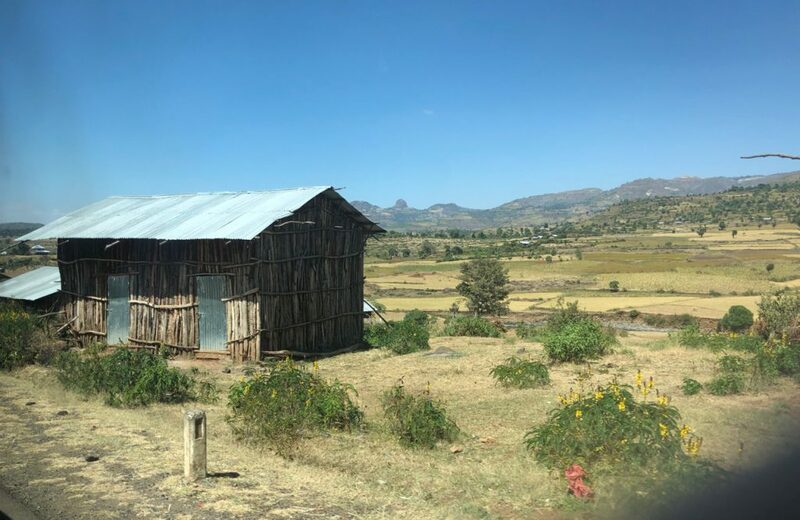 We were glad to be moving on from Addis and excited to see the countryside along the way. It was an epic ten-hour journey. 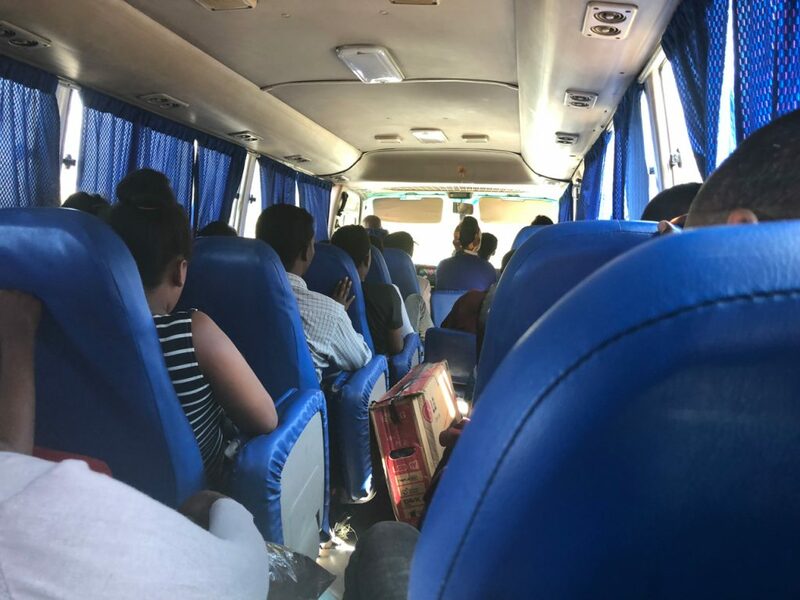 This in itself wasn’t too bad, except for the fear of needing a wee on a bus with no toilet, we drank very little so by the time we arrived in Bahir Dar, we were feeling dehydrated and also quite hungry. That afternoon, we sorted out tickets for a boat ride the following day on Lake Tana, followed by a delicious fish dinner at Dasai Lodge. However, the earlier dehydration must have taken its toll, because that night I had a nasty migraine. I was a little shaken from the night. Migraines are horrible. It’s such a relief when they finally subside. I felt fresh and rejuvenated in the warmth of a new day with a clear head. After breakfast, we went down to the lakeside where we joined a boat with other tourist folk, heading out to visit the monasteries. Along the edges of the lake grew papyrus grass, reminding me of my time living in Kisumu around Lake Victoria. Lake Tana is the source of the Blue Nile and our skipper took us past this point where we were delighted to see the hippos bobbing about. 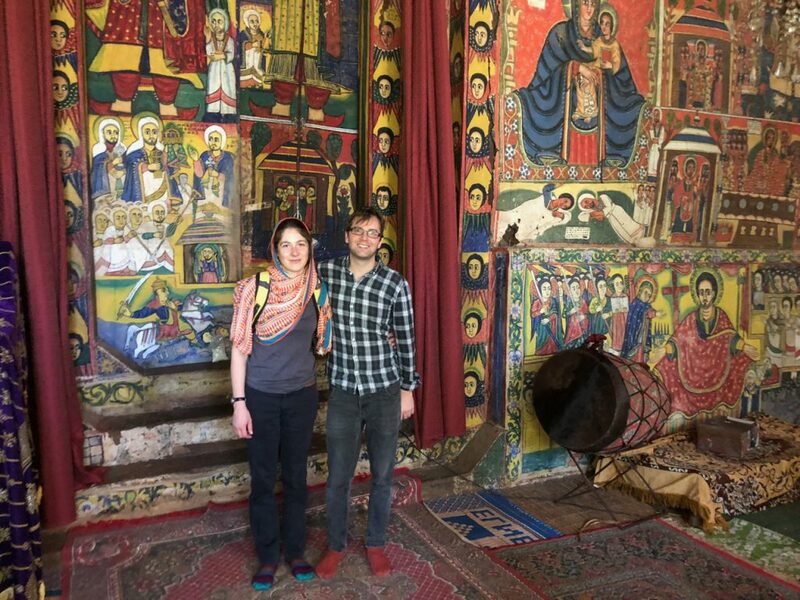 Lake Tana has 20 monasteries dating back to the 14th Century on its islands and peninsulas. We visited a small handful, each one beautifully decorated and sited within peaceful sanctuaries rich in nature, preserved thanks to the conservationist characteristics found in Orthodox Christianity. Speaking with my botanist Uncle later, he explained that it’s almost only around orthodox churches in Ethiopia where small pockets of conservation can be found. At large, much of the land has been stripped of its forests and the biodiversity has consequently shrivelled. The diversity of trees that once existed are only replaced by small patches of fast-growing eucalyptus trees, that may provide firewood to communities, but soak up their water reserves and erode the soil. I digress. 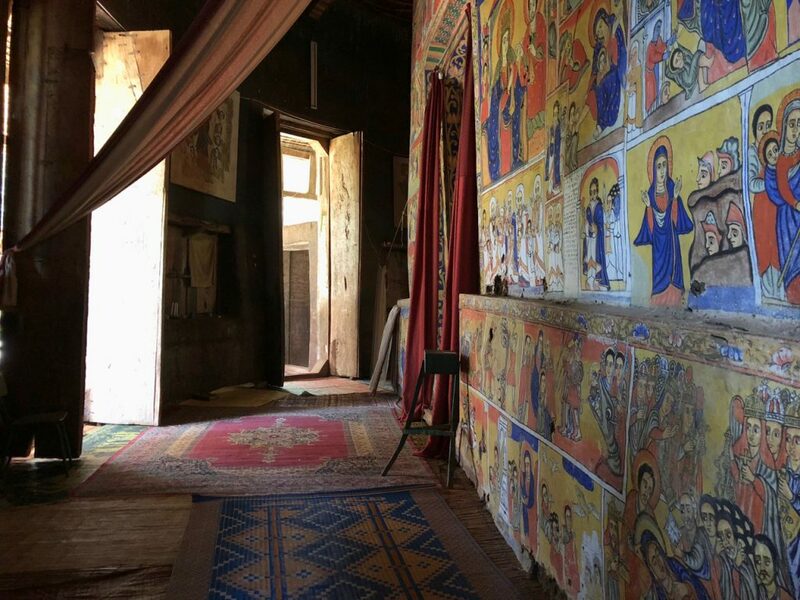 The monasteries were beautiful buildings with artwork rich in colour, depicting the biblical stories prominent in their oriental orthodox churches, which is considered one of the oldest strains of the Christian church. In the artwork, one story often found is of St. George, Ethiopia’s patron saint, slaying the dragon. The outer building of the church is round with an arched structure supporting a thatched roof. On the inside of this lies the church building itself which is square. Heavy rugs line the floors with little by way of furniture. It’s common to see an ancient chest and African drums lying around. 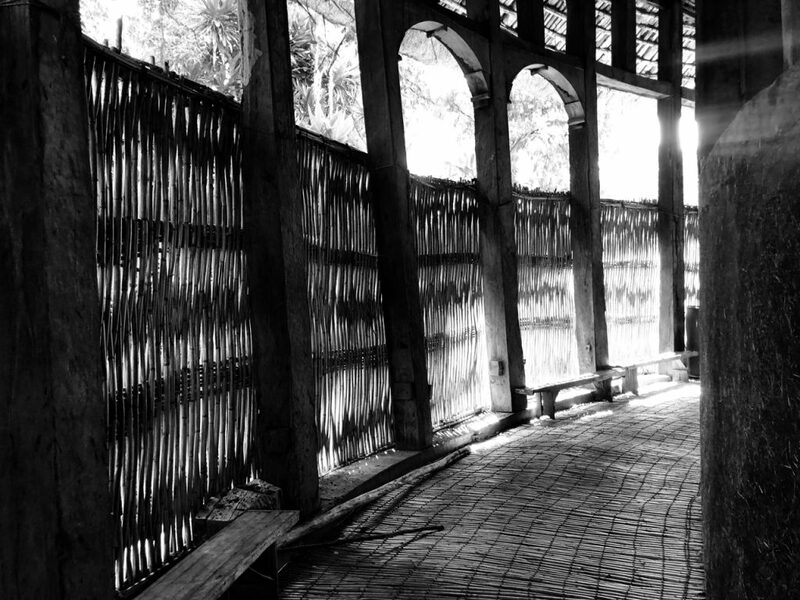 Inside each church, there is also an inner sanctuary that tourists cannot enter. Inside of these, there will be an ancient bible and legend has it that one of these monasteries housed the Ark of the Covenant for 800 years. Back on dry land, we headed to a lakeside restaurant for the afternoon with a couple of chaps we met on the boat who were over from Uganda. The evening was a quiet one, sitting in a cafe playing cards.